Rai grinned and felt relief wash ovet her. 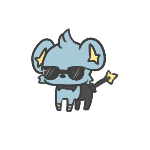 “Okay Blade, like we praticed!” She yelled and the absol jumped up to it’s feet and swayed a little. “Sucker Punch!” She commanded. Gabe grinned. "Sounds we have a plan." Gabe looked silently at the island getting closer for a few minutes before turning yo Noemi again. "You have a fire type for the contest?" He asked. Sarah glanced at the clock in the dashboard of the jeep. It would be close but doable if they were lucky enough to find a gligar soon for Reve. The two other trainers watched on somewhat quietly, and had already discarded any garbage that was left from inside. “Do you want some help?” The darker haired boy asked calmly, “Or are you alright?” Carrena just rereleased Angel from her Pokéball to check if she was alright. "I have Anjay- my fletchling. I think she will evolve soon. Other than that I don't so maybe I should challenge someone to a battle and see if thats enough?". It would probably not work but it was somthing. Even if it wasn't enough. Gabe nodded. "I don't think my Fletchling is that close to evolving but with the gym battle and of we train afterwards it could be enough for yours. We have the rest of the day. Easy peasy." Gabe was perhaps overly positive but he was sure that Noemi's Fletchling would evolve before the contest. He was glad he had Tepig, still thinking it was the perfect pokemon for the contest. Sarah noticed that Carrena had let Angel out again. "Angel is doing better again?"' she asked, glancing at Andy to see if he was almost done. Alana nodded to herself, a smile of approval on her face. A good move. The attack hit before the stars had been fired at the opponent and the Starmie fell in the water of the pool. "Recover, darling," she said and a light glow could be seen on the water surface as the Starmie recovered some of the damage it had taken. Moments later it burst through the surface of the water and landed on one of the platforms. "Let's do another confuse ray." The Starmie readied the attack. "Don't need any help," Andy said as he threw the final item away. "In fact, it's all done. Hop in everyone! Let's go to the cave!" He took place on the driver seat, put the key in the igniton and waited for everyone to get in. As soon as everyone would be seated, he'd start up and drive away. "I think we will be there soon", Noemi said, rasing a hand to screen her eyes. She really hope that they were making the right plans. Avatar made by Aust for MY USE ONLY! Collecting Zophian Canisters (ZC) for Charms! Looking for Solgaleo and Lunala for UB Hunting! Shelby stated at the doors of the lab. She hadn't gone inside yet. She was a bit nervous and Finn could tell. He was looking his trainer up and down before nuzzling against her arms that were holding him, urging her on to go into the lab. She glanced down at her Poochyena partner. "Alright... Let's go. I know you want to meet the new member of the team." She muttered to him. Finn barked back, happily. His tail wagging, hitting against her arm as she finally took a step in. She looked around, not exactly knowing which way to go.. So she started to slowly explore the lab before finally finding the professor's office. She knocked on the door shakily, hoping and waiting for a response. I'm sure you can tell that I love the Generation One starters. Meanwhile, A very powerful trainer rises fromthe depths. 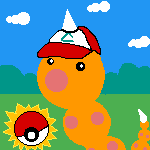 The trainer known as Orange." Raichu, Minun, Time to train! "Magikarp, your not ready for battle yet." 5 Minutes Later" Alright Raichu use Quick Attack! Minun! Use Tackle! Both Faint* Nice job you two! Alright now to get to a pokemon center."